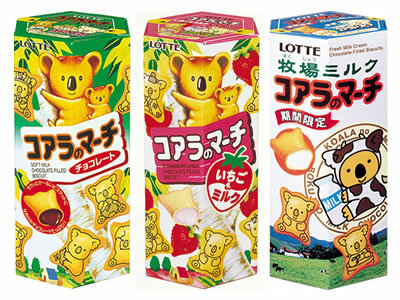 Koala's March (コアラのマーチ) is a type of Japanese confectionary. They are a biscuit filled with sweet flavoured cream. A number of different flavours exist with the most commonly available outside of Japan being chocolate, double chocolate, strawberry and milk but in Japan more unusual flavours such as honey, banana and pancake are available. The biscuits are really kawaii, with lots of differently-posed little koalas - it seems almost too sad to eat them...almost!